Many financial websites suggest that the best way of maintaining a low interest rate on your credit cards is by moving your balance every few months, in order to take advantage of introductory interest rates. It is true that, for many people, this represents a good option for keeping down the cost of borrowing. However, there are alternatives to this system; the balance transfer method, while often effective, can be over-publicised as a result of the financial incentives given to sites who encourage new custom. One such alternative is known as the Credit Card Shuffle. This system is made up of several different steps, each of which can be used either individually or in conjunction with the others. Its major advantage over continuous balance transfer is that it will leave little or no footprint on your credit history, whereas constantly applying for new cards can be detrimental to your score. In order to take full advantage of the Credit Card Shuffle, you must have more than one store card, credit card or overdraft already open. If you wish to protect your credit score, opening new credit cards in order to carry out the process is not a good idea. To begin with, you should list all of your credit card, store card or overdraft debt, including the interest rate, credit limit, balance transfer fee, and size of debt. Looking at this list, you should be able to see where your largest debts lie, and which are the most expensive. The idea behind the Credit Card Shuffle is to ensure that you are borrowing as cheaply as possible. In order to do this, you should look at the card with the lowest interest rate. Transfer as much debt from the most expensive card onto the cheapest card, until you have reached your credit limit. In this way, you are likely to be saving yourself several percentage points' worth of interest every year. You should then concentrate on paying off the card with the lowest interest, and constantly transferring your other balance onto this card in order to take advantage of the lower rate. There are several preparatory steps that you can take to ensure that you are getting the most out of the Credit Card Shuffle. First of all, you may well be surprised at what you can get if you simply ask your credit card companies to reduce your interest rate. They are more interested in retaining your custom than in retaining one or two percentage points. It would be particularly useful if you could get the lowest rate reduced, as this would have a knock-on effect for the whole process. Similarly, you could try to get the credit limit on your cheapest card raised. This will mean that you can transfer more debt onto this card, thereby minimising expensive debt and speeding up the process. 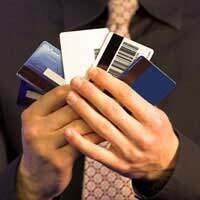 The Credit Card Shuffle has few downsides, but there is one main factor which you should consider. Most credit card companies charge a fee for balance transfers, although this fee is often waived in the first six months as an introductory offer. Depending on the size of your existing debts, this fee may mitigate the savings you will make to the point at which the process is no longer worthwhile. However, if this is the case then your debts are unlikely to be large enough to warrant embarking on the process anyway.